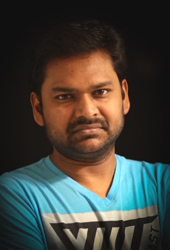 Sreekanth R Vempati is a Mechanical Engineer by profession & a movie maker by passion. Born in Warangal district & Studied Btech in SRKR engineering college, Bhimavaram & Completed Masters in Wayne State University,Detroit & attended Motion Picture Institute of Michigan in Detroit. Worked as an assistant director for the CITIZEN fame director Sam Kadi's thesis film SCHEZOPHRENIA. Worked as an assistant director for Sagar Pasala's short film "Last Chances" who recently announced "S/O.Pedarayudu" with Manoj. Sreekanth wishes continue to pursue his passion & eventually plans to break in to main stream movies.